I found this great iPhone app last night called slydial [iTunes link]. It lets you leave a voicemail on someone's mobile phone without bothering the person to answer. So, the recipient will not get a ringtone but will get your voicemail message. And it's free! I think it's great especially if the person is working and shouldn't be bothered by a phone call. I'm in the local television news business. During this morning's news show, I sent a voicemail to one of my cameramen who has an iPhone. It worked like a charm! If I had called him normally, it most likely would have disrupted what was going on in the studio. Some people have had trouble accessing the app for download, though. In fact, I tried to download it on my iPhone last night and that didn't work. So, I tried it to download it through iTunes on my desktop computer and that worked. This morning I clicked on the slydial name after a search and iTunes told me it was not available in the U.S. After clicking on the name again, it worked. So, if it doesn't work for you try to download it on a desktop computer. And if one click doesn't work, try again. This app will reward you if you're persistent. UPDATE: I found out that leaving a voicemail message through slydial also leaves a missed call notification. So, make sure you explain to that person in the voicemail what you did or else they're going to think they're going crazy! 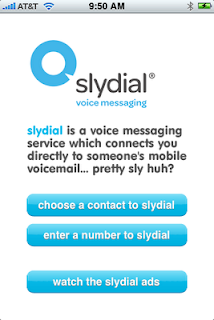 Also, slydial works with ANY mobile phone, not just iPhones. hmm, tried this with my gf, and she said she got 1 ring and then a missed call notification, and called me back while i was leaving the voicemail. ah ok, nevermind. it didn't actually ring. she had it on vibrate and the vibrate was a missed call. it worked with 2 other phones. awesome! !